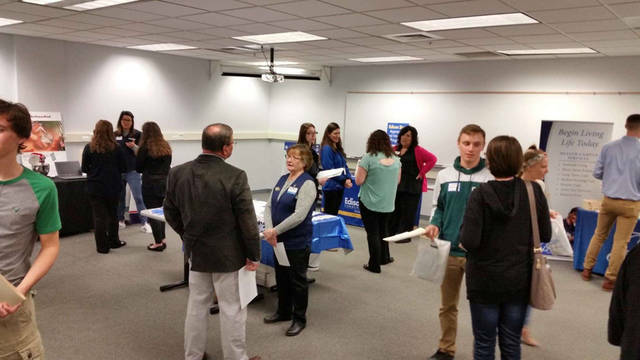 Students from Ansonia Local Schools, Franklin Monroe Local Schools, Greenville City Schools and Mississinawa Valley Schools participated in Darke County Economic Development’s Senior Interview and Networking Event. The fourth annual event is sponsored by Darke County Economic Development and open to all county high school seniors. This year, the event was held at Edison State Community College-Greenville Campus. Students interacted with employer representatives in the networking area to learn more about local career, education and development opportunities. 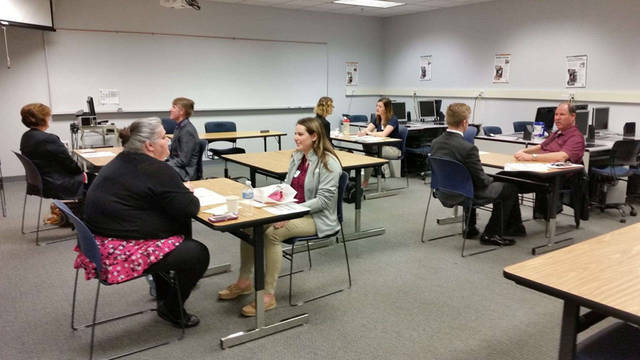 Attending students also participated in three 15-minute interviews with area employers and received feedback on their interview. When registering for the event, students indicated their employment and career interests. Students then were matched to employers who offered opportunities in their career interests or were matched based on the type of employment they were seeking. During the event, students were able to submit their applications to any of the participating businesses. Participating employers represented career areas including business, education, engineering/science and technology, information technology, health care, manufacturing, public safety and retail. “With the new location this year, we were able to expand the variety and number of employers involved and add new career areas to the event,” Tamala Marley, workforce specialist with DCED, said. Students also learned more about the Hometown Opportunity website and app through which they can apply to local careers and locate area openings. DCED thanked the following for their participation: Ansonia Local Schools, Franklin Monroe Local Schools, Greenville City Schools, Mississinawa Valley Schools, BASF, Brethren Retirement Community, Darke County Commissioners, Darke County Sheriff’s Department, DOSS, Edison State Community College, Family Health, Fort Recovery Industries, FRAM, Greenville Federal, Greenville National Bank, GTI, JAFE Decorating, Midmark, Mote & Associates, Pohl Transportation, Spirit Medical Transport, Ramco, Second National Bank, Village Green, Voisard Tool, Walmart, Wayne HealthCare and Whirlpool. Volunteers included Superintendent Jim Atchley, Commissioner Matt Aultman, Dennis Baker, Joyce Colville, Superintendent Doug Fries, Rodd Hale, Eileen Litchfield, Matt Staugler, and Mayor Steve Willman. DCED also thanked Chad Beanblossom, vice president of regional campuses, and Edison State-Greenville Campus staff for all their help in making this event a success. For more information about this and future school/business events, contact Darke County Economic Development at 937-548-3250 or mnealeigh@darkecounty.com.